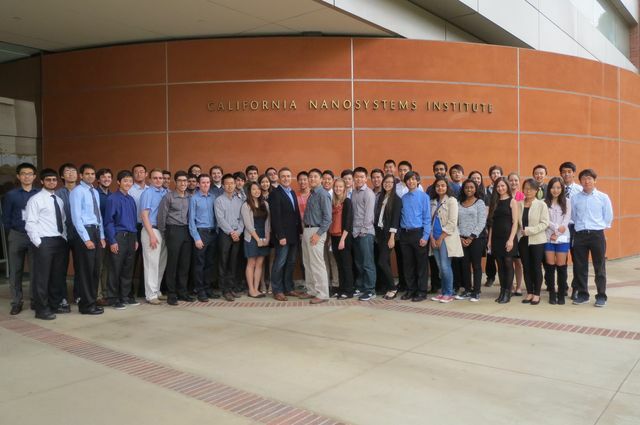 Professor Aydogan Ozcan (in the middle) with the HHMI Undergraduate Research Group at CNSI. Researchers may one day be using their smartphones to help them detect bacterial pollutants in water or dangerous viruses in blood samples. 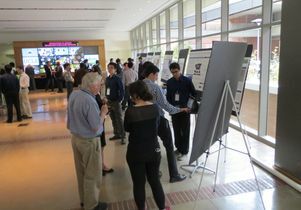 That’s a scene from the future that became less of an illusion and more of a reality check last week when more than 30 UCLA undergraduate researchers participated in the first annual Presentation and Demo Day of the Howard Hughes Medical Institute (HHMI) Undergraduate Research, Training and Innovation Program for Translational Biophotonics and Telemedicine Technologies. 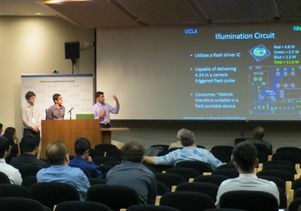 Among the projects students presented at the California NanoSystems Institute were many using a technique called holographic microscopy, which will expand the value of smartphones, equipped with image sensor chips. This “lensless” technique uses a light-emitting diode to illuminate a sample, creating a holographic shadow that the smart phone can send to a remote server that analyzes the data. It then can reconstruct an image of the sample in seconds. 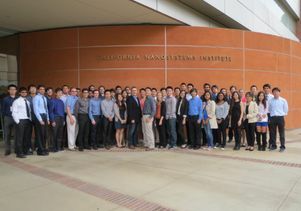 Organized by the Ozcan Research Group of the UCLA Henry Samueli School of Engineering and Applied Science, the event featured an impressive array of biomedical engineering technology research done by undergraduates, much of it already published in peer-reviewed scientific journals or presented at leading conferences of their fields. Poster session for the HHMI Undergraduate Research Group at CNSI. 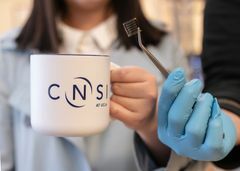 Ozcan, who leads this HHMI program, is also associate director of the California NanoSystems Institute and Chancellor’s Professor of Electrical Engineering and Bioengineering. The event featured two sessions of oral presentations, two poster/networking sessions and an awards banquet. The students were judged by a faculty panel, and attendees voted for recipients of awards in various categories. The People’s Choice Award, voted on by all attendees, was won by Brandon Berg, 22, whose research is on a new mobile phone-based multiplexed immunoassay technology. Research on this technology has not yet been published. “I’ve always really enjoyed science and mathematics, and those things go together,” Berg said. He realized he wanted to be a scientist in his senior year of high school when he had an exceptional physics teacher whose passion for science inspired Berg to become a physics major and get involved in science in college. He will be graduating later this month and attending the University of Michigan to begin a physics Ph.D. program next year. The Best Poster Presentation award went to Ashutosh Shiledar, Jeffrey Wong and Saba Janamian for their lens-free, imaging-based air monitoring technology. Other winners were Best Project and Best Demo Presentation awards for “High throughput volumetric detection of Giardia lamblia in water samples using real time holographic microscopy” by Patrick Wolf, Hardik Patel, and Kyrollos Yanny. This undergraduate research program will continue annually, giving more than 30 students each year an opportunity to conduct research over the academic year on translational bio- and nanophotonics technologies, aimed at various mobile health and telemedicine applications. 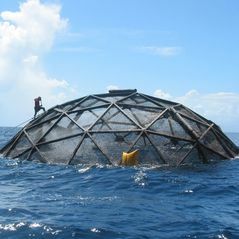 The program was created by Ozcan and is funded by the HHMI Professors Program. More information is available here and here. Patrick Wolf, Hardik Patel, and Kyrollos Yanny give their presentation that won two awards at the event.